You’ve been carrying on with your handgun training at the range regularly, and you finally have a good grasp of the fundamentals of shooting. Your grip is solid, you have the basics of sight alignment down and your point of aim is almost always your point of impact. Congratulations! You’re on the right track to becoming truly proficient with your handgun, but you’ve still got more to learn. Once you’re comfortable with the fundamentals, it’s time to move on to the next level and start practicing some intermediate to advanced skills. Here is a short list of skills that will greatly benefit casual handgun enthusiasts and are a must for those carrying or thinking of getting involved in competitive shooting. Being able to safely and quickly draw from a holster is an absolutely essential skill for those who carry or are thinking about getting involved in competitive shooting. Learning to draw through dry fire practice will allow you to develop the feel of a smooth, consistent draw without the dangers that come with working with a live handgun. This is also a great opportunity to check your equipment to find out if the holster you’ve chosen has any shortcomings. With dry fire practice, you can get your issues figured out before you move to working with a loaded gun. If you carry concealed, make sure to practice drawing with your concealment clothing on, though I would strongly recommend learning to draw out without them on first. Once you’ve got the feel for drawing from the holster during dry fire practice, move on to the range and practice drawing and firing at a specific location on a target. If you’re not hitting what you’re aiming at, you’ll need to slow down and make sure you’re draw is smooth AND your shot is on target. This is important self-defense skill is often overlooked, but it’s important to at least get a feel for shooting accurately at close distances without bringing the gun sights up to your eyes. In some forms of competitive shooting, it’s referred to as “shooting from retention”, and requires holding your arm next to your body and shooting from the hip. The first time I shot from retention, I brought my elbow too far in front of my body and punched myself in the stomach, which was quite surprising and unpleasant. It’s an awkward position to shoot in and care has to be taken to make sure all of your body parts are behind the muzzle at all times. It's important to practice this skill before you end up in a situation where you have no choice but to fire without seeing your sights. I don’t know anyone that enjoys dealing with malfunctions while shooting, but it is part of the reality of owning and operating a handgun. Many malfunctions that you will encounter with your handgun can be cleared using similar techniques, and “tap, rack, bang” will quickly become your friend. When you break it down the mechanics of it, malfunction clearing is a 2-part process – first, you need to be able to identify what is causing the problem, and second, you need to know which technique to use to clear the malfunction. I know what you’re thinking, “I already know how to load my magazine with ammo, that’s easy!” This is the other kind of reloading; changing your magazines while either shooting or on the move. If you carry or are going to shoot competitively, practice by hitting your magazine release, grabbing another magazine off your belt, inserting another magazine into your gun, then firing at least one shot at a target. If you don’t have a magazine pouch to wear on your hip, practice by grabbing a magazine off a table. As with any other skill, the most important part of learning to reload safely is making sure you keep your finger off the trigger and the gun stays pointed in a safe direction. Practicing your reloads can be done easily in dry fire practice, just remember that all the basic safety rules apply when you are working with your gun. Always triple-check your gun to make sure it is not loaded before engaging in any dry fire practice. 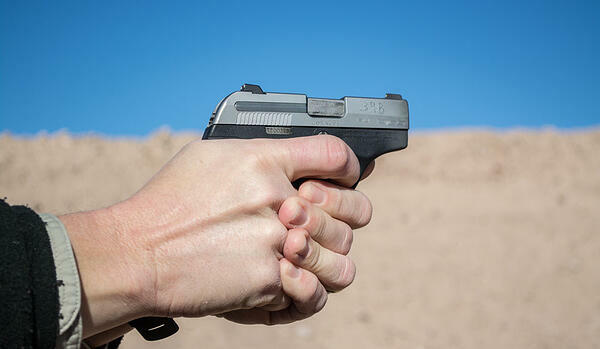 These skills are by no means an exhaustive list, but they are a few of the most important handgun skills you should be proficient in, whether you carry, compete or just plink at the range. Don’t feel the need to go it alone; if you’re not sure where to get started, contact a skilled trainer to help you learn these skills correctly and safely. Then, it’s up to you to motivate yourself to practice them until you can repeat them successfully at will.